The couple cried at London’s High Court as their lawyer said time had run out for 11-month-old Charlie. THE PARENTS OF terminally-ill child Charlie Gard are dropping their legal bid to send him to the United States for experimental treatment. Lawyer Grant Armstrong says Chris Gard and Connie Yates are withdrawing their appeal to court orders saying Charlie’s treatment should end. The couple has been fighting court rulings saying their son’s life support should be withdrawn. The High Court judge in the case had instructed that he intends to make a decision on the case tomorrow. However, the parents now say it is “no longer in Charlie’s best interests” to pursue treatment. Charlie suffers from a rare genetic condition and has brain damage from which he will not recover. His parents Chris Gard and Connie Yates have been battling to raise funds and clear legal obstacles to allow him undergo a nucleoside therapy trial in the US. However, doctors have concluded that his treatment could cause prolonged suffering. Email “Charlie Gard's parents drop their fight to take him to the US for treatment”. 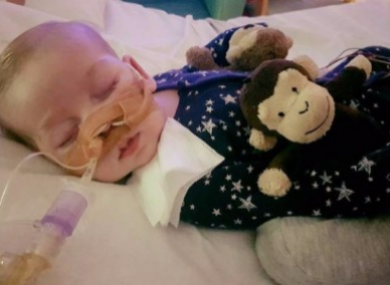 Feedback on “Charlie Gard's parents drop their fight to take him to the US for treatment”.